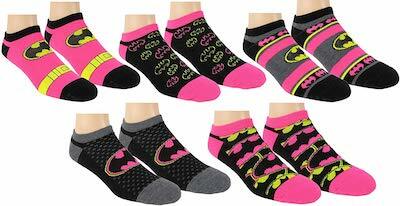 If you want something keep your feet warm then check out these 5 pairs of women’s Batman socks. Yes you will get 5 pairs of socks and each pair looks different but all have the Batman logo on it. The women’s socks are size 9 – 11 and made from 70% polyester, 20% nylon, and 10% spandex. As you can see on the picture these Batman socks have a lot of black and pink on them but also some grey and yellow and all show the famous bat symbol but some more then others. So now you can have a pair of clean Batman socks for every day of the work week.